In Austin, Texas, it's all about the music. MARGO PRICE: (Singing) Let's go back to Tennessee, you and me. Let's go back to Tennessee. Let's go back. MCEVERS: That's Margo Price, one of the breakout musicians at this year's South by Southwest playing at Stubb's Barbecue, one of Austin's many downtown venues. It's the 30th anniversary of the festival. Thousands of people are crowding the streets and finding live music everywhere they go. Among them is our own Audie Cornish. She went to the epicenter of South by Southwest earlier today, Sixth Street and Sabine, to take it all in. STEPHEN THOMPSON, BYLINE: That's awesome. >>CORNISH ...Attached to a laptop. QUENTIN THOMAS-OLIVER: That's right, yeah. CORNISH: It's an analog drum machine somehow. THOMAS-OLIVER: It is an analog drum machine. It's actually reading written notation. I made it so that I write it in notation and that notation drops a little file. And then I have custom-written software that goes up and reads the file from the notation software. CORNISH: And you are going up and down Sixth Street with this device, this rolling drum parade (laughter). THOMAS-OLIVER: My name is Quentin Thomas-Oliver, and I play in a band called Ponytrap with my wife, Hillary Thomas-Oliver. CORNISH: So for you, what's sort of the point of coming to South by Southwest? THOMAS-OLIVER: Oh, I'm no different than any other musician, even though there's that - the giant snowman of robots which I really love. That was new for me. Even though I have this kind of crazy contraption, I'm really just doing the same thing everybody else is, just trying to get my voice heard. 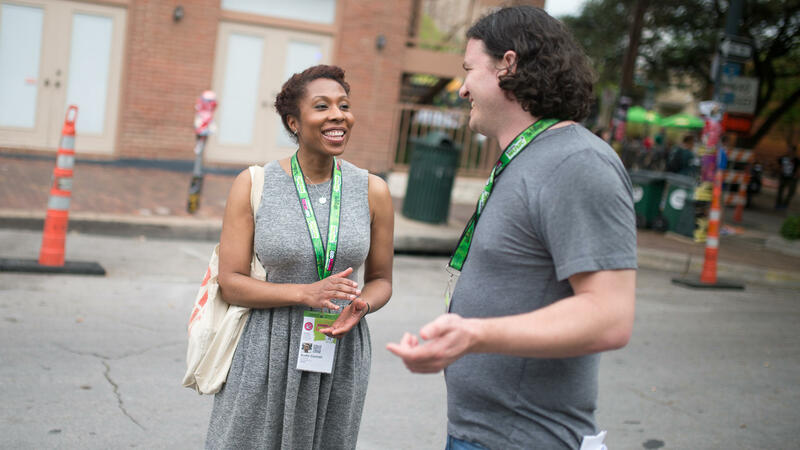 CORNISH: So what's it like trying to get discovered at South by Southwest? Well, we're going to turn now to Stephen Thompson of NPR Music. He's been coming to this festival for how long, Stephen? THOMPSON: This is my 20th year out of the 30 that the festival has existed. CORNISH: ...The city. But I feel like that's not all. THOMPSON: Right. I think that's a gross underestimation of how many stages there are because you have a lot of official showcases going on that are sanctioned by the festival. But then because you have thousands of music fans converging on the city, everyone in music wants to be here. And so you'll see stages pop up in the strangest places. For a few years, bands used to play in the mouth of a 54-foot Doritos vending machine. I've seen bands perform in the middle of a busy thoroughfare. I've seen bands perform on the back of flatbed trucks, and I have seen bands perform in absolutely - as I did this morning - in an absolutely empty venue. And it's very hard to leave when that happens. CORNISH: ...about South by Southwest. I mean, is that kind of a bygone era? When you talk a Doritos machine - people performing in a Doritos machine, it feels like, you know, it's probably jump by corporate shark. THOMPSON: Well, I mean, talking about discovery, like - how is anything fully discovered as if no one had ever heard it before? Like now you start a band, you can put your demos on SoundCloud the day you form as a band and have people potentially hear them if you have the right, you know, kind of social media push about you. Nobody is truly unheard anymore, and I think that something like this has a little bit less the feel of, quote, unquote, "discovery" and more almost the feel of like product launches. So I sort of feel like South by Southwest isn't necessarily taking musicians from point A to point B. It's taking them from point C to point F.
CORNISH: NPR's Stephen Thompson here with us in Austin at South by Southwest on its 30th anniversary. Thanks so much. 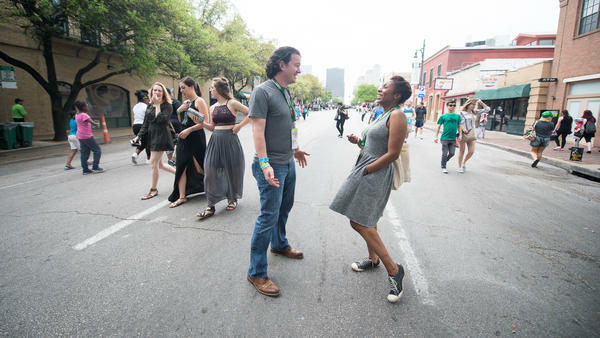 MCEVERS: You can find a hundred of Stephen Thompson's picks for the best acts at this year's South by Southwest at npr.org. Transcript provided by NPR, Copyright NPR. 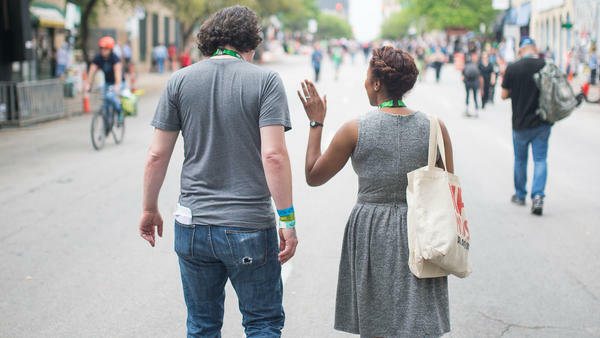 San Antonio shared the best in business, tech, marketing, branding, cuisine and arts over the weekend at Austin’s South By Southwest Festival. 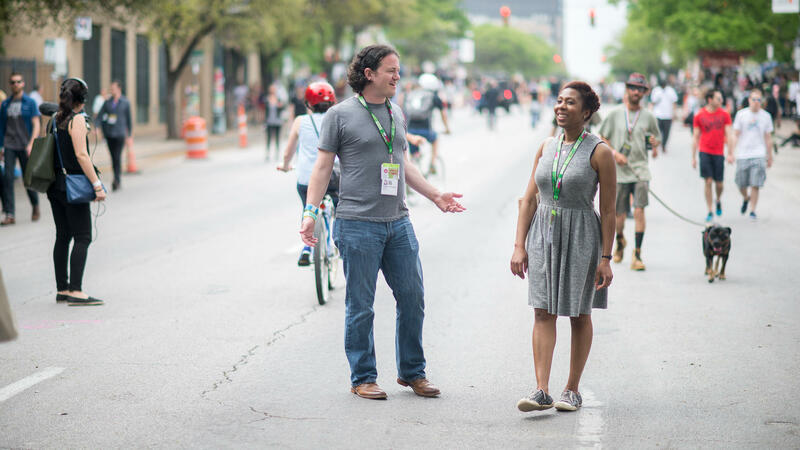 It’s the first time a coordinated effort has been made to showcase the Alamo City at the giant festival that now covers everything from music, film, and digital to education and environmental initiatives.